An industry of small, niche builders? A sort of anti-consolidation scenario - fewer multibrand companies and more independents building boats for specific niche markets - is one widely held vision of the post-recession marine industry. But it&apos;s only one of many potential boatbuilding landscapes emerging from all the speculation on the direction the industry will take as it attempts to shake off the effects of the worst down cycle in recent memory. One thing is a given: Even as the general economy shows signs of a budding turnaround, much of the marine industry remains in survival mode, one in which the key to survival is cash. There are no clear-cut answers. Conjecture abounds on the configuration of the industry that will emerge from the downsizing that has had builders scrambling to reduce field inventory, ramp down production, and create more wholesale opportunities for dealers hard-pressed to find lenders. Many companies have pared down by necessity, but a few are taking advantage of the market to acquire brands and grow, supporting the position that, regardless of the economy, there will be many successful, though vastly different, marine industry business models. "I&apos;m a believer that people make companies successful, not structures and size, and there will be good people working in big companies and good people working in small companies," says Clint Moore, president and CEO of Volvo Penta of the Americas. "Whether operating at 50 percent of a company&apos;s prior size plays to the strength of the independent, family-owned boatbuilder with their finger on the market or a bigger company, it&apos;s too soon to tell. Independent boatbuilders certainly have a passion for the business that&apos;s powerful and unique, but that&apos;s not to say that bigger companies aren&apos;t focused on the voice of the customer. The key is to survive the storm." Analysts say Brunswick Corp., the builder of 16 U.S. boat brands, will endure these economic gales. But some believe the industry is not likely to see new large, multibrand builders emerge anytime soon, in part because lenders and investors will view the industry as risky. Not only could that make it more difficult to grow through acquisition, it might make it tougher to break into the industry. "I think it&apos;s all about costs at this point," says Philip Gorham, an analyst with Morningstar Inc. who follows Brunswick. "It&apos;s fair to assume, I think, that going forward - at least over the next five years or so - that the boat manufacturing industry will look smaller than it was two years ago. So for a company to really expand into different categories, it would have to have tight control of its costs, and I don&apos;t see that model being replicated very easily. In fact, I think the opposite&apos;s true; not all manufacturers are going to be likely to broaden their targets." John Dorton is president and CEO of ski-boat builder MasterCraft - a brand that went through restructuring this summer when Wayzata Investment Firms converted its bonds to stocks, making it MasterCraft&apos;s largest shareholder. Dorton says smaller brands have typically fared better than their larger counterparts during tough times. "The smaller, independent builders that specialize in one niche have always outperformed bigger multibrands," says Dorton. "They are generally managed by groups much more involved in specialty markets. They have the capital structure to be more flexible, and they are generally more intuitive to the needs of dealers." Despite being a very high-end option in large inboard sportboats, Dorton says MasterCraft leads the segment in market share. "You don&apos;t see that often - where Rolex outsells Timex," he says. Being a focused, privately held company with a passion for the segment is a big part of that, says Dorton. Attempts by multibrand companies to enter MasterCraft&apos;s segment have been largely unsuccessful, he says. Despite lower volume, revenue is high for inboard boats, says Dorton. "It&apos;s just a nice area to be in," he says. "Saltwater fishing boats probably enjoy a similar dynamic [in which] smaller, single-line, independently owned manufacturers tend to be more dominant, and that may dissuade outside investors and lend itself to more independent companies." Dorton thinks public companies have difficulty entering niche markets because they operate under a different dynamic. He speaks from experience, because MasterCraft was briefly public. It issued stock in 1994 and was delisted in 1998. Dorton let management buy out private equity partners about a year later. "Being public forces you to think differently," Dorton says. "Anytime you have to run a business to satisfy Wall Street, it just requires different tactics that may not be consistent with boaters or marine dealers." With private companies, demands for return are determined by the owners, who can choose what to take on in any given year, Dorton says. When a company has to satisfy outside investors, it generally must stay consistent in returns. He says being smaller also helps niche builders stay in tune with what customers want. "Consumers expect a lot from us," he says, "especially in this trying economy. They are more discerning than they&apos;ve ever been, and we appreciate that." Dan Streech, co-owner and president of California-based Pacific Asian Enterprises, which designs, builds and distributes Nordhavn passagemaking yachts, says that because public companies are under pressure to make money for shareholders, acquisition is a common goal for achieving growth. "We&apos;re in a pretty good spot, all things considered," Streech says. "We didn&apos;t end up where we are and make our choices because we are particularly brilliant. It&apos;s not that clear-cut and glorious. There are many people like us. We&apos;re just hard-working little guys with a privately held company." Pacific Asian Enterprises is just beginning to feel the downturn, according to Streech. It has been working on a large backlog until recently, and has been at full production. Now that orders are dwindling, something will have to change, but Streech says that won&apos;t include buying or merging with other brands. Phil Keeter, president of the Marine Retailers Association of America, agrees builders will be less likely to grow through acquisition. "I think people are going to stay smaller," says Keeter. "I don&apos;t think anybody is trying to grow, except for some who may try to capture a market where another manufacturer goes down." Even that could prove difficult, Morningstar analyst Gorham speculates. "One thing you have to think about going forward is that lenders may be more reluctant to finance those kinds of deals," Gorham says. "If, as I expect, the industry is smaller two years from now than it was two years ago, manufacturers are going to have to come up with a strong argument for making that kind of acquisition, and they will have to demonstrate there is a cost savings. If, in the past, those niche manufacturers ... haven&apos;t been able to show that kind of cost savings is available, I think going forward it&apos;s going to be harder to get those deals done." Cash is king, regardless of size, says Thom Dammrich, president of the National Marine Manufacturers Association. After that, it just depends on a builder&apos;s goals. "If you&apos;re trying to produce the best X kind of boat and be the premium brand, and you only want to produce a few of those and there are only a few people who can afford it, that&apos;s one model," says Dammrich, who thinks some builders will find opportunities where others have failed. "If your goal is to produce really inexpensive boats and lots of them, that&apos;s another model." American Global Yacht Group is somewhat of an anomaly. It builds brands like Outer Reef Yachts and Newport Yachts, but also is a dealer for brands like Hunt and Formula. The company says its philosophy is not to be all things to all boaters, but to bring quality and service standards of the megayacht segment into various, complementary yacht lines. In May, AGYG purchased fishing-boat builder Southport Boats, a brand it had already sold successfully. "Our factory has excess capacity, and we see that as an opportunity to expand production when the market allows, or to add lines," says principal Jerry Cureton. "So we are targeting specific niches in the recreational marine industry as opportunities for us. "But this is a difficult path to negotiate in this economy," Cureton adds. "We are being extra careful." The credit crunch, both in retail and wholesale, is causing dealers to go out of business and factories to close, and will eventually prompt dramatic changes in the way boats are built, marketed and sold, Cureton predicts. "The margins on owned lines are much higher than dealer margins, and we can build for specific customers rather than build for dealer inventories," he says. "Owning our own lines, where we manage construction and marketing, allows us to expand and contract with much greater ease. We would not be at the mercy of factories and lenders. We are fortunate to have very good relationships and a long history of experience with high-quality yards in Taiwan. 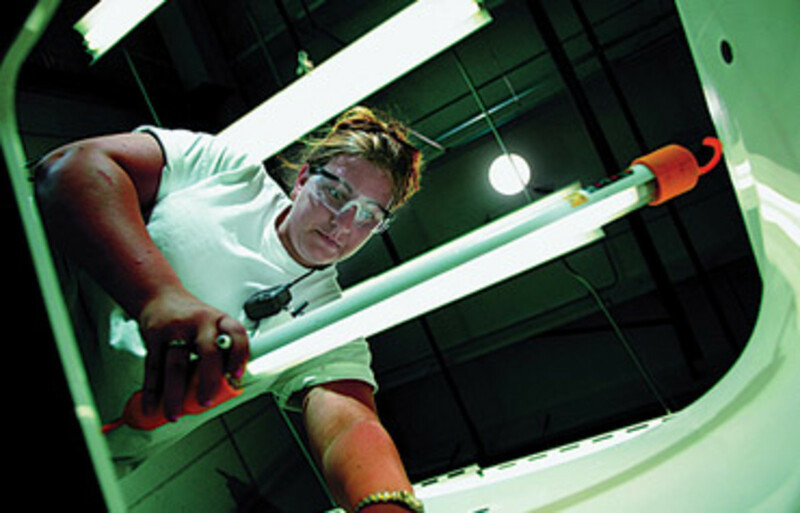 This allows us a competitive advantage in cost while maintaining high quality." The eventual goal, Cureton says, is to have sales and service locations in all major U.S. yachting destinations. Already established in South Florida, the Chesapeake and Seattle, AGYG has immediate plans to expand into the Northeast - Narragansett Bay in Rhode Island and somewhere on Long Island Sound. Longer-range plans include Texas and Southern California. The credit crunch could make it more difficult not only for companies looking to grow, but for those seeking to become boatbuilders or dealers. 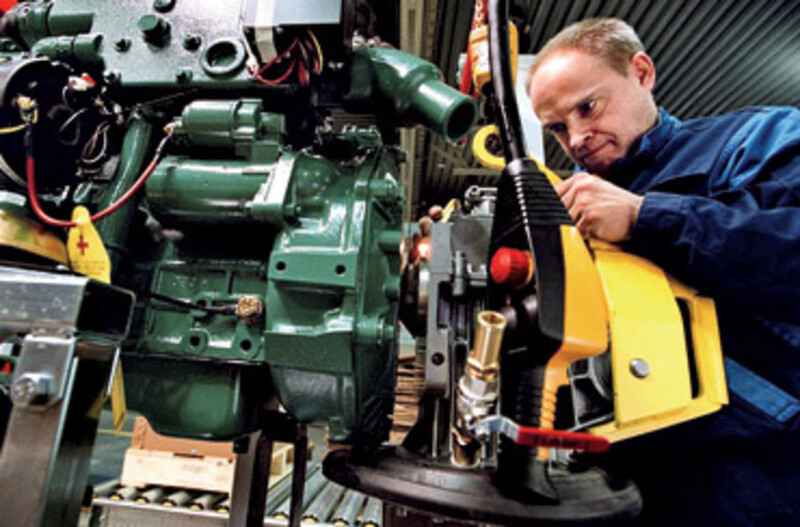 The most capital-intensive segment of the industry is engine manufacturing, says Volvo Penta president Moore. "To build plants, to tool new motors and meet emissions requirements is enormous in comparison to putting up a boat plant," he says. "Not to minimize it, but from a capital perspective, the heavy investing is done by engine companies." Hopefully, the ease with which one can enter the industry will change in the future, Moore says. "The financial support that was there in the old world might be different in the new world," he says. "It might not take more resources to tool a boat and build a plant, but it might take more to secure wholesale resources. That will be a significant variable for the foreseeable future." Dorton agrees that losing several major floorplan lenders, leaving only GE, hurt MasterCraft. The fiscal year that ended in July 2008 was the best in the company&apos;s 41-year history, he says. After three major lenders withdrew from marine wholesale financing, Dorton says, sales came to almost a standstill. "We had to shut things down and go into cash-crisis mode and work our way through our recapitalization," Dorton says. "In this economy, you can&apos;t save your way to success. You can&apos;t cut expenses fast enough. You&apos;re lucky to be cash-flow neutral if [you &apos;re] not cash-flow negative." The company has sold to private equity groups three times in the last 12 years. "The capital structure hasn&apos;t changed, and the philosophy hasn&apos;t changed, but now we have greater leverage," Dorton says. "We had to exchange equity for debt, so we&apos;re effectively debt-free - so we&apos;re more nimble and viable in this economy." When times are good, overhead tends to get high. "We probably got a little liberal when there was lots of money just a few years ago," says Dorton. "I&apos;ve been surprised by the ability to do without some of the things I held dear within the company, [seeing] the last piece of furniture go off the ship if you will. But it&apos;s amazing what you can do without. At the end of the day, the only way any of us will be able to fully get out of this is to sell and build our way out of it." In June, MasterCraft had 40 employees, down from 650 a year earlier. But in July, the company was able to rehire 175 workers at its Tennessee plant. 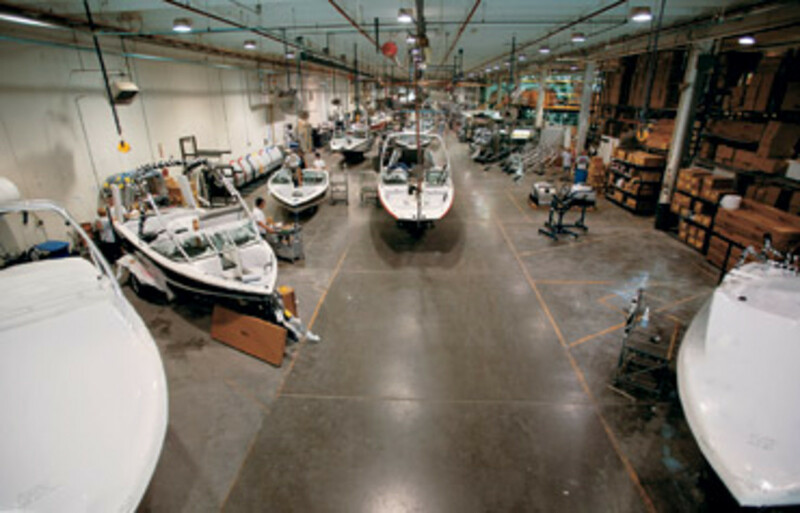 Genmar, second only to Brunswick in boatbuilder size, is reorganizing under Chapter 11- a move that has some industry insiders predicting the company will emerge with fewer brands. Other companies have had to lay off workers and furlough or close plants. Brunswick was one that responded quickly to the economic slide, which some say helped the company position itself to survive the downturn. But if Brunswick were to lose another of its giant dealers - it already has lost Olympic Boat Centers, which went into bankruptcy in 2008 - it could be in a more precarious position, says analyst Gorham. "A significant amount of Brunswick&apos;s revenue comes from a concentrated number of retailers, and [another] big bankruptcy like that could spell real trouble for Brunswick," Gorham says. While MarineMax - Brunswick&apos;s largest dealer network - also seems well-positioned for riding out the market collapse, Gorham calls its 44 percent decline in sales "quite horrific," though par for the course in this recession. Even though the company is executing well in terms of cash management, "in terms of retail sales it&apos;s still just carnage, and it will be some time before it improves, because you&apos;ve got this flood of used boats on the market." Brunswick chairman and CEO Dustan E. McCoy said during a conference call with analysts after releasing second-quarter results that he expects to see more dealer and builder failures as the boating season comes to a close. During the last 18 months of market weakness, dealers comprising about 16 percent of Brunswick Boat Group sales have failed or voluntarily closed their doors, according to Brunswick CFO Peter Hamilton. Moving forward, Brunswick conducts individual dealer analyses of potential future repurchase losses at each quarter, Hamilton says. "Although we do retain certain legal repurchase obligations, we discharge these obligations most of the time by transferring boats to other dealers who want to represent and sell our brands," Hamilton says. "This not only minimizes our financial exposure; it is also a process that steadily improves the strength and effectiveness of our dealer network." After second-quarter earnings were released, analyst Tim Conder of Wells Fargo Securities told Soundings Trade Only that Brunswick was well- positioned to be a low-cost producer with a strong brand portfolio that will drive material share gains within the context of a much smaller U.S. boat market. Brunswick stock had been moved from "hold" status to "buy" by Rochdale Research before those earnings were released. "Our experience over the past 18 months suggests that we can manage through this activity without major business or financial disruption," says Hamilton. Steve Wolpert, vice president of Brunswick&apos;s global boat operations, says Brunswick has some advantages in this market. "We have been taking excess capacity off line, both permanently and temporarily," Wolpert says. "There have been permanent consolidations at Brunswick," he continues, noting that the company&apos;s size gives it the ability to consolidate brands into fewer facilities. While many say the changes in the industry will be long-term, others think everything will return to where it was - sooner or later. "I don&apos;t think it&apos;s as broke as people like to think," says Nordhavn&apos;s Streech. "And, thus, I don&apos;t think it has to be as fixed as people think. It&apos;s just free market."